In his press conference on January 9, Ari Fleischer was asked "Can the administration say categorically that no one in the White House ever discussed Enron's financial situation with the company.?" His answer: "I'm not aware of anybody in the White House who discussed Enron's financial situation." The next day Fleischer revealed that Enron CEO Kenneth Lay had, in fact, spoken to Treasury Secretary Paul O'Neill on October 28 and November 8, and with Commerce Secretary Donald L. Evans on October 29. According to Fleischer, Lay discussed Enron's deteriorating financial situation with O'Neill, and asked Evans to help prevent Moody's Investor's Service from downgrading Enron debt. (Lowering the rating of Enron's debt was a contributing factor in Enron's eventual bankruptcy.) Later that day Attorney General John Ashcroft recused himself from the Justice Department's criminal investigation of Enron's collapse, which had just been announced. He was joined by the entire Houston U.S. attorney's office. As Republicans and the administration sought to spin the Enron debacle as a bipartisan scandal, the office of Representative Henry Waxman issued a report documenting the extent to which administration policies benefited Enron. Some observers pointed to the firing of FERC chairman Curtis Hébert as a clear indication of Enron influence in the White House; others noted that the Enron scandal "threatens perceptions that the right has spent decades creating." Although the administration said that Evans did not intervene with Moody's, Evans subsequently revealed that he had discussed the Enron contact with White House chief of staff Andrew Card. (Moody's, a private commercial credit rating service, downgraded Enron debt to "junk" status on November 28, forcing the company into bankruptcy court.) A Commerce Department spokesman added that Secretary Evans discussed the intervention request with counsel, and with Treasury Secretary O'Neill, before he "decided not to act." The revelations were inconsistent with Fleischer's statements from the previous day. Of course Fleischer had not stated categorically that there was no contact between the White House and Enron officials concerning the firm's impending collapse, merely that he was "not aware." The fine distinction fostered speculation that Fleischer was being intentionally kept in the dark in an effort to control media perception and speculation concerning the extent of White House involvement in Enron internal affairs, and vice versa. Fleischer continued to characterize interest in Enron as partisan, saying "The American people are tired of partisan witch hunts and endless investigations," and asserting that there was no need for a special prosecutor. Republicans in Congress, however, echoed calls from Democrats for full disclosure and cooperation from the administration. An unidentified Republican member of the House Government Reform Committee told the Washington Post, "By not getting it all out, it makes it look like they're covering something up." Former Clinton press secretary Joe Lockhart agreed. "Whatever the underlying facts are, they are creating the impression that there's something to hide," he told the Washington Post. Republican consultant Eddie Mahe told the Post that Bush should announce an internal investigation of administration ties to Enron. "I would hope that George W. Bush would understand and believe that it's the right thing to do. And if somebody did something wrong, he should throw them out." A recent CBS News poll found that nearly 63% of the public thinks the Bush administration is not disclosing everything it could concerning its relationship with Enron. Treasury Secretary O'Neill downplayed the significance of the call from Kenneth Lay. "I didn't think this was worthy of me running across the street and telling the president. I don't go across the street and tell the president every time someone calls me," he told Fox News Sunday. "... I frankly think what Ken told me over the phone was not new news. You all had been reporting for weeks that Enron had problems, that they were in trouble." O'Neill admitted to two conversations, one on October 28, and one on November 8 or 9. He denied that Lay had requested a bailout, although subsequently admitted he was aware that his undersecretary for domestic finance, Peter Fisher had been asked for one. On January 11, Treasury Department spokeswoman Michele Davis reported that Enron president Greg Whalley called Fisher up to eight times in October and November, seeking Fisher's assistance in obtaining additional bank loans. In 1998, while working at the Federal Reserve Bank of New York, Fisher had been instrumental in organizing the bailout of Long Term Capital Management. The White House acknowledged that Mr. Lay had specifically compared Enron's plight to the LTC situation with O'Neill and Fisher, but reported that Fisher declared the analogy "not apt." During the period of Mr. Lay's frequent calls, Fisher reportedly contacted investment banks, including Goldman Sachs and Morgan Stanley, to assess the effect of an Enron failure on the banking system. These contacts by Mr. Fisher and others in his department were apparently with credit and trading personnel, and did not include the chief executives at either firm. Attorney General Ashcroft received $50,000 in campaign contributions from Enron and Kenneth lay during his unsuccessful bid for senatorship from Missouri. As reported by Riverfront Times, the Lay/Enron contribution was among the top five contributors to the Ashcroft Victory Committee. Other than the Republican National Committee, Ashcroft's committee was the top recipient of a single donation from Lay. In 1998 before Bush was an official candidate for the presidency, Lay hosted a fundraiser in Texas for Ashcroft's presidential campaign. In fact, Lay contributed the $1,000 personal maximum to Ashcroft's first senatorial campaign in 1994. In a letter to Rep. Henry Waxman of California, dated January 3, David Addington, the vice president's legal counsel acknowledged that Enron officials met six times with the Bush administration's energy task force. In addition to a 30-minute session between Enron CEO Kenneth Lay and Vice President Cheney that had been previously disclosed, Enron officials met with members of the task force in large and small groups. According to the Walls Street Journal, two meetings occurred after the task force had completed its report. The last took place on October 10, not long before Enron found itself in bankruptcy court. "None of these meetings included a discussion of the financial position of the Enron Corporation," Mr. Addington wrote. Waxman responded to Addington's letter on Tuesday, January 8, requesting additional detail. Addington's response "raises additional questions about the extent to which Enron may have influenced the administration's energy policies or provided information about its own operation." Mr. Waxman noted that Vice President Cheney voiced opposition to electricity price caps in California the day after meeting privately with Mr. Lay. Enron had previously opposed price caps in California. In comments on January 11, Bush tried to downplay his relationship with Kenneth Lay, saying that in 1994 Lay had supported Ann Richards in the Texas gubernatorial campaign. To some, this lame attempt recalled the debate over "what the meaning of is is." According to the Dallas Morning News, Lay did contribute to Richards' campaign, but donated three times as much to the Bush campaign. As reported elsewhere in The Dubya Report, Enron and Mr. Lay have donated over $550,000 to various Bush campaigns. According to the Center for Responsive Politics, Enron, Mr. Lay, and former Enron CEO Jeffrey Skilling each contributed $100,00 toward the Bush-Cheney inaugural. Bush claimed that he "first got to know" Mr. Lay after being elected governor. This runs counter to allegations by Rodolfo Terragno, former Argentine minister of public works, that Dubya had lobbied him on behalf of Enron in 1988 or 1989. 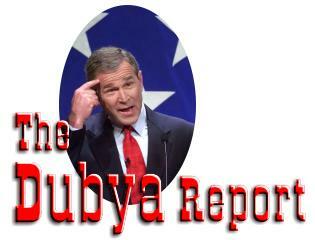 Lay himself seemed to contradict Bush's claims in an interview with PBS Frontline. "I was very close to George W. and had a lot of respect for him, had watched him over the years, particularly with reference to dealing with his father when his father was in the White House and some of the things he did to work for his father, and so did support him." As chief executive of Enron, Lay had become "a major force" in Houston business and social circles, as well as a significant fundraiser for "Poppy" Bush. "That's when I probably spent a little more quality time with George W.." Lay told the Dallas Morning News. Lay chaired the host committee for the 1992 Republican convention in Houston. While governor of Texas, Dubya advocated deregulation of the utility business, the single most important issue to Enron and Kenneth Lay. On Mr. Lay's recommendation, Bush appointed Patrick H. Wood III to be chairman of the Texas Public Utility Commission. As we've reported elsewhere in The Dubya Report, former Mississippi state utility regulator Curtis Hébert was originally appointed chairman of the Federal Electrical Regulatory Commission (FERC). When Hébert undertook an investigation of the pricing policies of energy traders like Enron, he received a call from Kenneth Lay. According to an investigation by the New York Times and PBS, Lay offered to help Hébert to keep his job if he agreed to support aspects of utility deregulation. Hébert declined, and Patrick Wood is currently chairman of the FERC. Continuing the trickle-down admissions, on January 12, the administration revealed that Energy Secretary Spencer Abram had called Mr. Lay on November 2. The Commerce Department admitted that, in addition to the previously announced communications with Enron, Secretary Evans had called Mr. Lay in mid-November to discuss Enron's power plant in Dabhol, India. On January 16 the White House revealed that former Enron consultant -- and current chair of Bush's Economic Council -- Lawrence Lindsey conducted a review in October of the potential economic impact of an Enron collapse. White House spokesman Ari Fleischer told Reuters that Lindsey did not discuss his findings with Bush. Lindsey received $50,000 from Enron in 2000, prompting suggestions that he recuse himself from discussions about Enron. Rep. Henry Waxman commented to Reuters, "The conflict of interest rules place restrictions on what former advisers do once they enter public service. That is why it is important for Mr. Lindsey to fully disclose his involvement with Enron." "The economic team had conversations with themselves to explore this, not in reaction to any phone calls they had with Enron officials," Fleischer said. He would not say whether Lindsey had discussed Enron with Treasury Department officials. "They may have, so what?" he said when pressed. Lindsey's review was disclosed after the fact on a television news program. It has come under scrutiny in part because of its apparent failure to consider the impact of an Enron failure on thousands of small investors who owned stock in the company. The same day Rep. Waxman's staff released a report entitled "How the White House Energy Plan Benefited Enron." The report asserted that there were at least 17 policies that "were either advocated by Enron, or from which Enron benefited financially." The policies fell into four general categories. Policies that promote the deregulation of the electricity market. In 1999 Enron officials told Congress this was Enron's "single most important initiative.&quot The White House plan also supports repeal of the Public Utility Holding Company Act (PUHCA), which would allow Enron to acquire greater ownership of electric utility companies. Many consumer groups believe PUHCA protects consumers by preventing a company from purchasing a utility, and then siphoning off its resources for other investment. The plan also endorses a provision for which Enron lobbied, which grants FERC projects the power of eminent domain. Selecting sites for power and pipelines has traditionally been under state authority. Policies that promote energy derivatives and commodities markets. The White House energy plan advocates exempting derivatives trading in the energy sector from federal oversight. Policies that expand natural gas and oil production. A key provision in the White House plan allowed so-called "expedited permitting." Major energy production and distribution projects must demonstrate that their construction will not cause unacceptable environmental damage. Environmental organizations argued that expedited permitting denied "agencies with responsibility for protecting the environment sufficient time and resources to adequately evaluate the environmental impacts of a particular project." Other policies that benefited Enron. The White House plan included specific language pertaining to energy projects in India, where Enron was struggling with its Dabhol power plant. The plan further charged the secretaries of State, Commerce, and Energy with increasing support of energy company projects overseas. future." In large part, however, the plan contains policies recommended by Enron. To the layman on the street, it will look like we recognized funds flow of $800 million from merchant asset sales in 1999 by selling to a vehicle (Condor) that we capitalized with a promise of Enron stock in later years. Is that really funds flow or is it cash from equity issuance? ... It sure looks to the layman on the street that we are hiding losses in a related company and will compensate that company with Enron stock in the future.... I am incredibly nervous that we will implode in a wave of accounting scandals. The overriding basic principle of accounting is that if you explain the "accounting treatment" to a man in the street, would you influence his investing decisions? Would he sell or buy the stock based on a thorough understanding of the facts? If so, you best present it correctly and/or change the accounting. My concern is that the footnotes don't adequately explain the transactions. If adequately explained, the investor would know that the "entities" described in our related party footnote are thinly capitalized, the equity holders have no skin in the game, and all the value in the entities comes from the underlying value of the derivatives (unfortunately in this case, a big loss) AND Enron stock and N/P. Looking at the stock we swapped, I also don't believe any other company would have entered into the equity derivative transactions with us at the same prices or without substantial premiums from Enron. In other words, the $500 million in revenue in 2000 would have been much lower. How much lower? In a glimpse of Enron management practices the letter also recounts that when Enron treasurer Jeff McMahon presented CEO Skilling with a five-point ultimatum the implementation of which would be necessary for him to remain as treasurer, Skilling promoted McMahon to CEO of a subsidiary and did nothing to address the complaint. Approximately a week after the release of the Watkins letter, several former Enron employees alleged that Enron Energy Services, a division of the company that sold electricity and natural gas to commercial and industrial customers, systematically misstated profits. The allegation is significant, in part, because Energy Services was led by Thomas White, now Secretary of the Air Force in the Bush administration. Energy Services was created in 1997 to take advantage of the national deregulation of electricity markets. The company operated independently from Enron itself, but its financial results were included in Enron financial statements. Energy Services was organized so that it could use "mark-to-market" accounting. Traditional accounting allows a company to record profits only when it has delivered services to customers. Energy Services instead estimated profits over the term of a contract, based on a series of assumptions about energy cost, use, and even regulatory environment. Then it would report the projected results as profits, and pay sales representatives accordingly. More favorable results could be obtained simply by making more optimistic assumptions. Managers making the fundamental assumptions on which the projections were based came under considerable pressure to make optimistic estimates, according to Glenn Dickson, a manager who was fired in December. "The people that were having to sign off on the deals with a gun to their head knew that it wasn't a good deal." Dickson acknowledged that mangers knew their assumptions were unrealistic. Expenses ballooned, however, as the management of contracts proved more costly than anticipated. "They knew how to get a product out there, but they didn't know how to run a business," former product development manager Tony Dorazio said. A former employee charged that under the leadership of Mr. White and Lou L. Pai, Energy Services would sign almost any contract, but management did not pay much attention to daily operations. Energy Services continued to publicly report profits, while it was actually losing money from unprofitable contracts, according to former employees. Margaret Ceconi, a former sales manager, wrote a letter to Kenneth Lay informing him that Energy Services was hiding losses by recording them in the more profitable wholesale division. "It will add up to over $500 million that E.E.S. is losing and trying to hide in wholesale," Ms. Ceconi's letter said. Mr. White, and Enron executive for 11 years, reported owning $25 million in Enron stock when he became Secretary of the Army. He was paid $1 million in severance. During his tenure at Energy Services, the firm sold a contract to the Army worth $25 million over 10 years, to provide energy to Fort Hamilton in Brooklyn, NY. As Secretary he has advocated privatizing base energy services, which would entail contracting with firms such as Enron. Tyson Slocum, research director for Public Citizen described White's history as "a colossal conflict of interest," adding that at the time of his confirmation, Enron had seven bids pending with the Pentagon. Following his confirmation, White was required to sell his shares of Enron within 90 days. He obtained an extension through November 20, but eventually sold his interest in mid-October, just before Enron disclosed the problems that led to its bankruptcy filing. In a letter to Rep. Waxman White detailed 30 contacts with Enron employees since June 2001, including phone calls and personal meetings. White maintains that the contacts were all "personal in nature," and that he was not asked to intercede on Enron's behalf. The case of former pest exterminator, Rep. Tom Delay of Texas, and his staff, illustrates Enron's modus operandi in Congress. Delay received nearly $30,000 in donations from Enron since 1989, according to the Center for Responsive Politics. In addition, Enron used two key Delay staffers as lobbyists: Ed Buckham and Karl Gallant. A onetime chief of staff for Delay, Buckham went on to run Delay's political action committee, Americans for a Republican Majority. Gallant, who once served as that committee's director, now runs the Republican Majority Issues Committee, a group that tries to counter the political clout of labor unions by funding get-out-the-vote programs for conservative candidates. The issues committee received contributions from Kenneth Lay and another Enron official totaling $75,000 in 2000. The Republican Majority group received a total of nearly $60,000 from Enron between 1995 and 2000. In return, Delay championed House energy legislation favored by Enron and other energy producing companies. Associates of top Bush political advisor Karl Rove say he recommended Republican strategist Ralph Reed to Enron in 1997, as George W. Bush was considering a run for the presidency. Reed, who obtained a consulting contract worth $10,000 to $20,000 a month had just left the job of executive director of the Christian Coalition. The Christian Coalition is described as "an organization of committed religious conservatives." Mr. Rove's associates told the New York Times that the move was designed to keep Mr. Reed in the Bush camp, without putting him on the payroll. Mr. Bush did not want to be seen as too closely associated with Mr. Reed, because of Reed's extreme evangelical and right-wing views, but at the same time Mr. Rove did not want Mr. Reed to back another candidate. An unidentified "friend of Mr. Bush" reported a conversation in July 1997 in which Rove took credit for finding the Enron job for Mr. Reed. Republican Trevor Potter, a former chair of the Federal Election Commission, commented, "If it was done for the avowed reason to keep Reed satisfied and out of someone else's political camp, it illustrates what everyone in the Republican world has known for years: Enron has been an important source of political power in the party." Mr. Potter added that the arrangement could have been a violation of Federal election law, if "it was a backdoor way of getting him extra compensation for the time he was spending on Bush activity." At about that time Mr. Reed did become an unpaid consultant for the Bush campaign. Later his firm was paid for direct mail and telemarketing services. Even the National Security Council was apparently not immune to Enron influence. According to the Washington Post, last June the NSC " acted as a sort of concierge service for Enron Chairman Kenneth L. Lay and India's national security adviser, Brajesh Mishra." Documents released last week by the Overseas Private Investment Corp. under a Freedom of Information Act request revealed that the NSC used its clout to try to gain an audience with Indian officials for Mr. Lay and the bankers involved with the Enron's Dabhol power plant. Observers noted that traditionally the State Department would take the lead in lobbying foreign governments on behalf of U.S. corporations. Susan Schwab, a Commerce Department official from the first Bush administration and now dean of the University of Maryland's School of Public Affairs, remarked, "It's a new definition of national interest that embodies the national economic interest.... It's not as blatant as 'what's good for General Motors is good for America,' but it's the globalized version of that." group's plans for August included an item titled "Enron trip." The government blacked out the destination before releasing the the information. In September the Dabhol group's calendar included a visit to India by U.S. Trade Representative Robert B. Zoellick. Before joining the administration Zoellick was a paid consultant to Enron. As this article was being written, J. Clifford Baxter, a former Enron vice-chairman was discovered dead of an apparent suicide. The House Energy and Commerce committee had asked to interview him, and he had been named in a federal lawsuit accusing him and other Enron executives of profiting from sale of Enron stock prior to the company's collapse. The tragic news underscores the significance of the unfolding Enron scandal as symbol. "The wealthiest people took their money off the table and the average people got stiffed." Democratic national chairman Terry McAuliffe said. "Enron is a metaphor for the Bush administration,"
The political right has expended considerable hot air, not to say dollars, promoting the view that "concerns about the gap between haves and have-nots [are] obsolete 'class warfare'." Yet here is Enron, as Paul Krugman observed recently, "a real-life story that reads like a leftist morality play: wealthy executives make off with millions while ordinary workers lose their jobs and their life savings." After all that effort to convince people that the private sector can police itself, the most admired company in America turns out to have been a giant Ponzi scheme. Fleischer, Ari. White House Press Briefing. 9 Jan. 2002. Committee on Government Reform U.S. House of Representatives. 16 Jan. 2002.